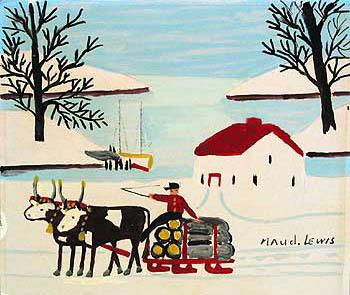 Folk Art is art which does not come out of the fine art tradition. 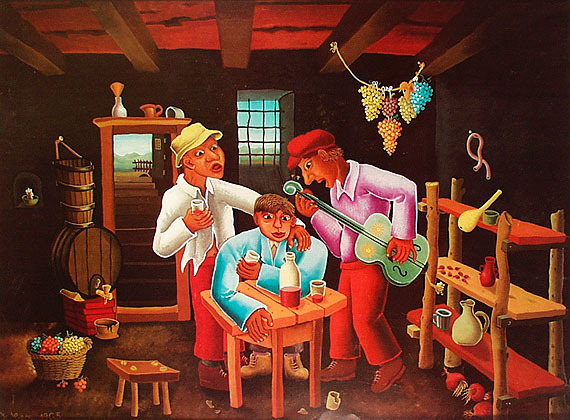 Folk Artists are typically from rural or pre-industrial societies, and are more closely related to craftsmen than they are to fine artists. 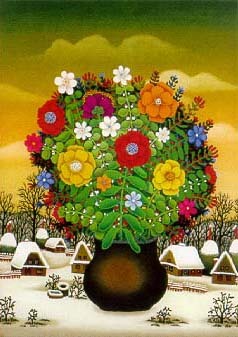 Folk Art is characterized by a naive style, in which traditional rules of proportion and perspective are not employed. 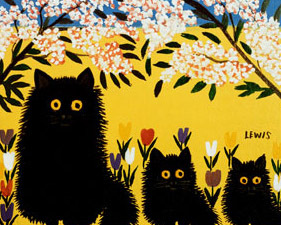 Closely related terms are Outsider Art, Self-Taught Art and Naive Art. 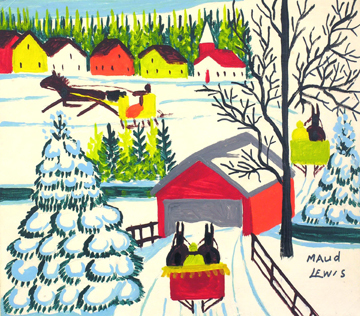 Well-known Folk Artists include the American painters Grandma Moses and Edward Hicks, and the Canadian painter Maud Lewis. Term applied to the work of non-professional, self-taught artists who, while lacking orthodox skills, apply themselves to their art in a resolute and independent spirit. 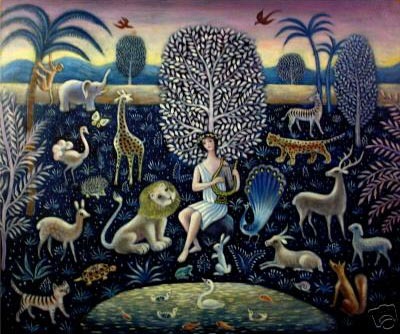 The history of naive art is both the history of the complex evolution of the many art forms lying outside the fine arts tradition and of the critical attempts to disentangle a distinct strand from this broader fabric. 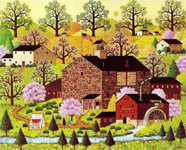 In the course of the 19th century in Europe, the arts and crafts of rural peoples (normally termed FOLK ART, or sometimes ‘peasant art’) and the urban traditions of semi-skilled craftsmen gradually faltered in the face of growing industrialization. Factory products enfeebled the individual impulse to fashion handmade artefacts; itinerant portrait painters (‘limners’) found their trade dwindling after the advent of photography; and in general the rise of an industry-based economy and the growth of cities sapped the vitality of vernacular and communally recognized artwork such as embroidery, toymaking, the carving of ships’ figureheads, painted targets and so forth. Similar developments took place in North America, though at a slower pace, partly determined by a wilful defence of inherited models on the part of culture-conscious immigrants. 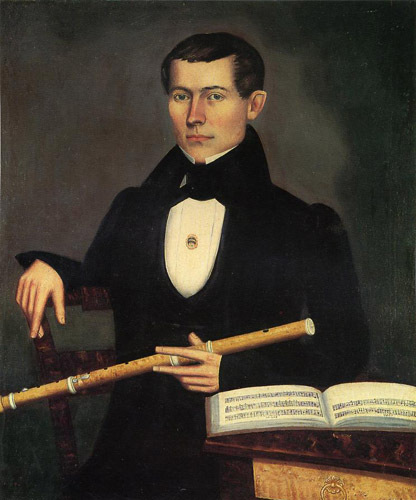 (b Leverett, MA, 19 May 1805; d Leverett, 28 June 1900). 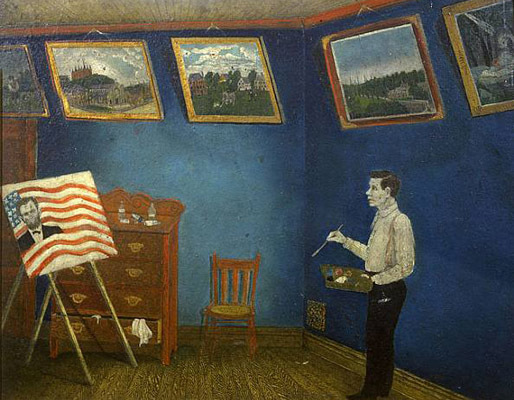 American painter. He studied with Samuel F. B. Morse in New York during the winter of 1824–5. On his return to the rural isolation of Leverett, MA, he painted his earliest known work, the portrait of his grandmother Elizabeth Billings Ashley (Springfield, MA, Mus. F.A.). 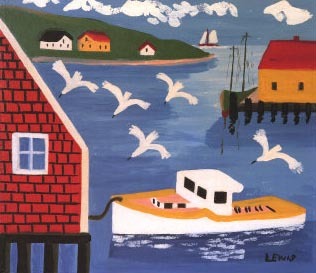 His career as an itinerant portrait painter began in 1826, most of his commissions coming through a network of family associations in western Massachusetts and Connecticut. The portraits of 1836–40 are considered his best. 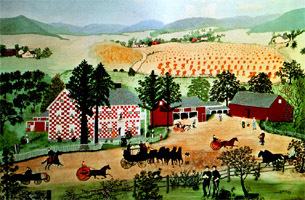 From 1841 he lived mainly in New York, where he expanded his subject-matter to include landscapes and American history pictures. There he presumably studied photography, for on his return to Massachusetts he advertised himself as a daguerreotypist. 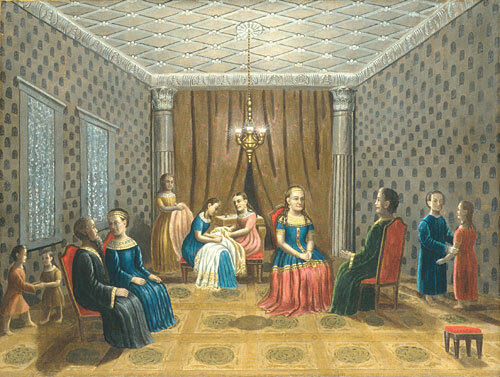 His few portraits painted after 1841 are copied from his own photographs and lack the expressive characterization and decorative power of his earlier work. 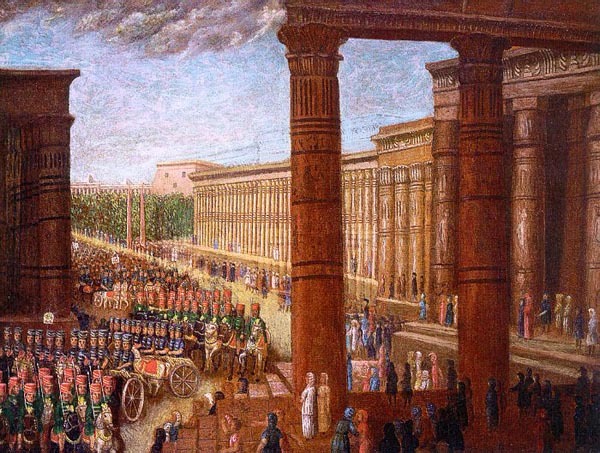 From 1865 to 1885 his paintings were based primarily on biblical and patriotic themes. The Historical Monument of the American Republic (1867–88; Springfield, MA, Mus. F.A.) 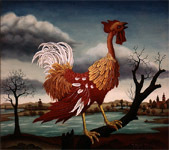 stands alone in American folk art in size, scope and imaginative vision. 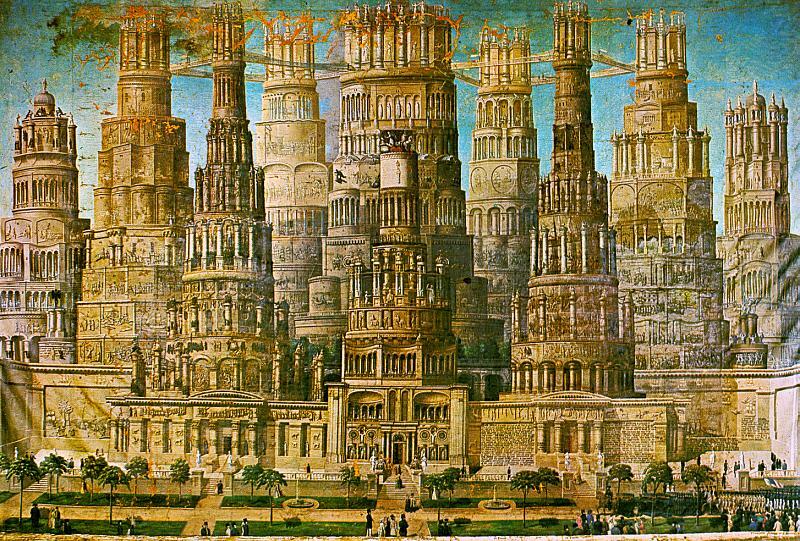 Inspired by plans for a national celebration of the centennial of the USA in 1876, Field painted an architectural fantasy of eight towers linked by railway bridges and trains at the tops, with the history of the USA in low-relief sculpture on the exterior surfaces of the towers. 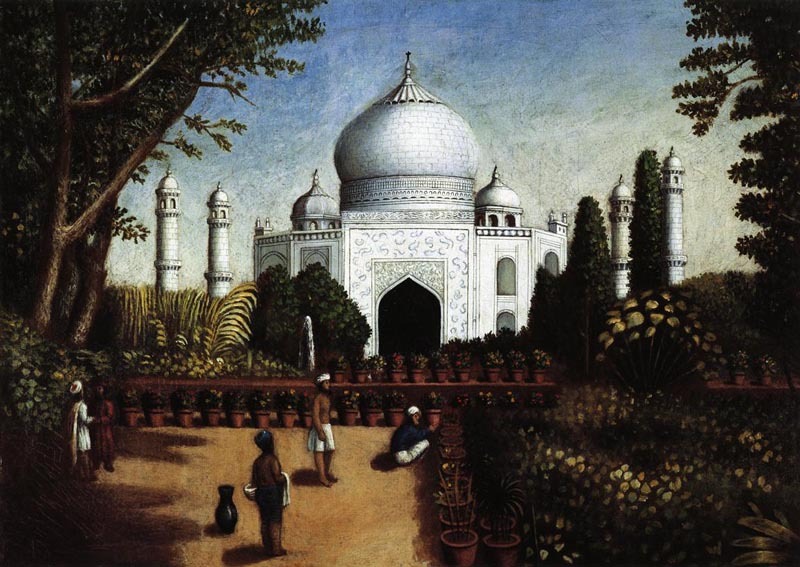 Field added two more towers to the painting in 1888 and thereafter retired. 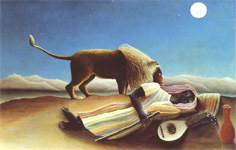 also spelled Naïf Art, work of artists in sophisticated societies who lack or reject conventional expertise in the representation or depiction of real objects. 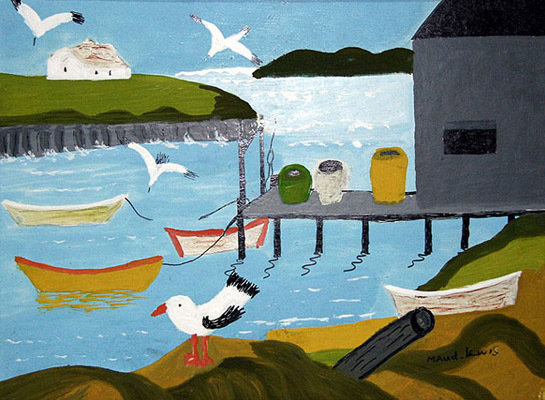 Naïve artists are not to be confused with hobbyists, or “Sunday painters,” who paint for fun. 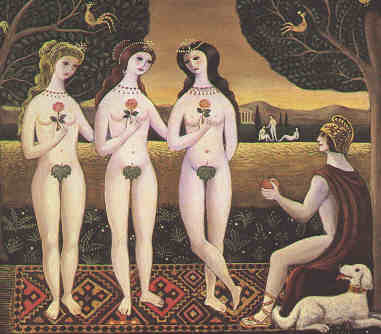 The naïve creates with the same passion as the trained artist but without the latter's formal knowledge of methods. 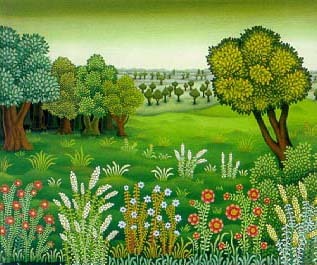 The most frequently reproduced examples of naïve art are the works of the French artist Henri Rousseau , whose portraits, jungle scenes, and exotic vegetation are widely admired. 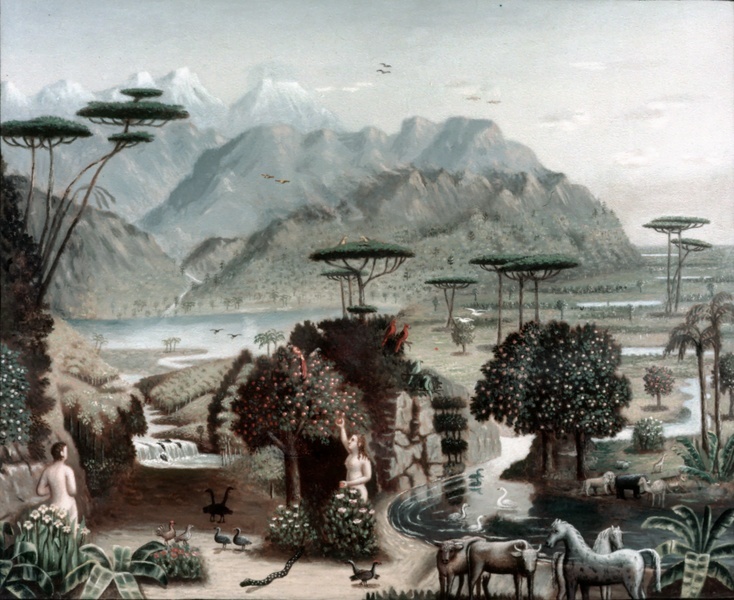 Rousseau's paintings, like many others of this genre, convey a sense of frozen motion and deep, still space, and the figures are always shown either full face or in fairly strict profile (the naïve painter rarely conceals much of a face and almost never portrays a figure completely from the back). 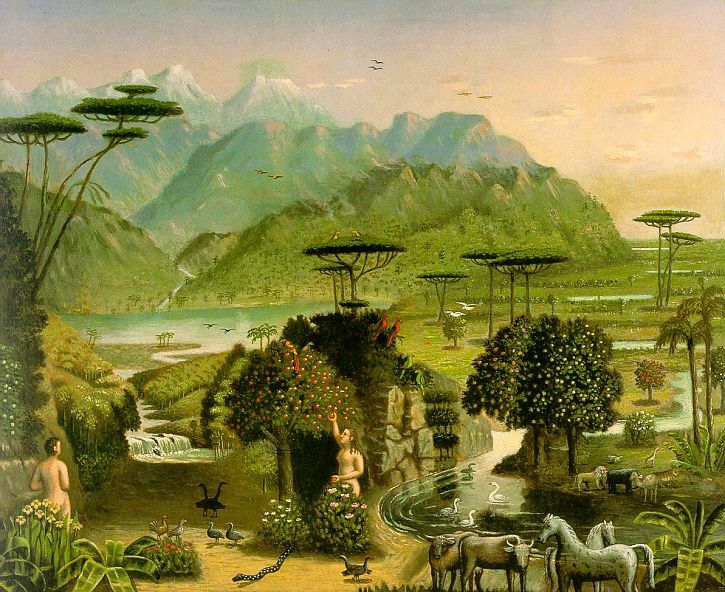 Like many naïve painters and sculptors, Rousseau projects his intensity and passion through his figures—especially the staring eyes—and the precision of his line and colour. 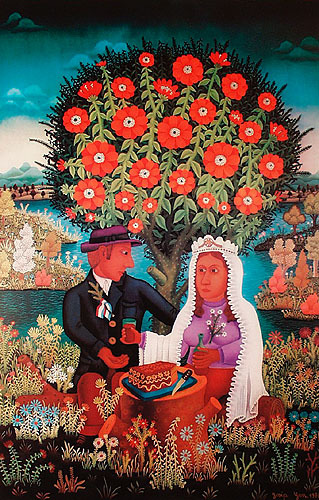 The appreciation of naïve art has been a fairly recent phenomenon: many of the artists still living never expected their work to be so eagerly collected. 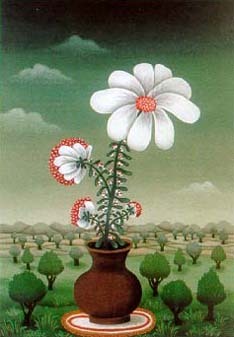 By the mid-20th century most developed nations had naïve artists who had risen to some prominence. 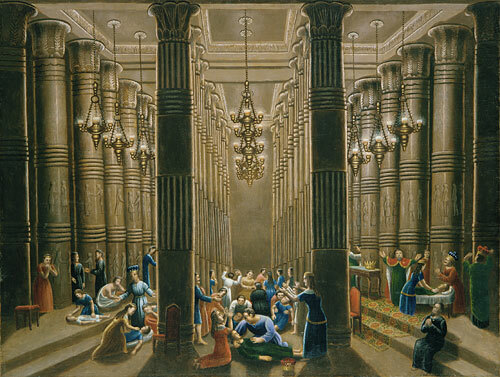 While some naïve painters consider themselves professional artists and seek public recognition of their work, others refuse to exhibit for profit and paint only for their families or for religious institutions. 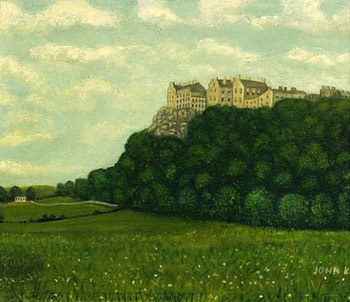 died August 10, 1934, Pittsburgh, Pennsylvania, U.S.
original name John Cain Scottish-born American artist who painted primitivist scenes of Pittsburgh, Pennsylvania, and Scotland. In 1879, after working in a coal mine since childhood, John Cain immigrated to the United States (where a banker's misspelling changed his name to Kane). He worked as a steelworker, gandy dancer (railroad man who stamps gravel between the ties), street paver, house painter, carpenter, andamateur boxer. After losing a leg in a railroad accident, he became a watchman and a boxcar painter. 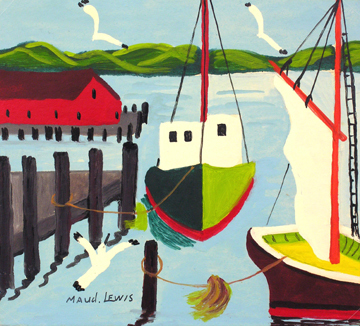 For his own pleasure he would paint landscapes on boxcars during his lunch break, covering them over with regulation flat paint in the afternoon. 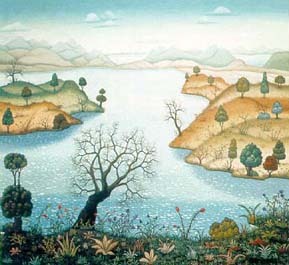 After losing his job in 1900, he continued painting landscapes and made a modest living colouring portrait photographs. 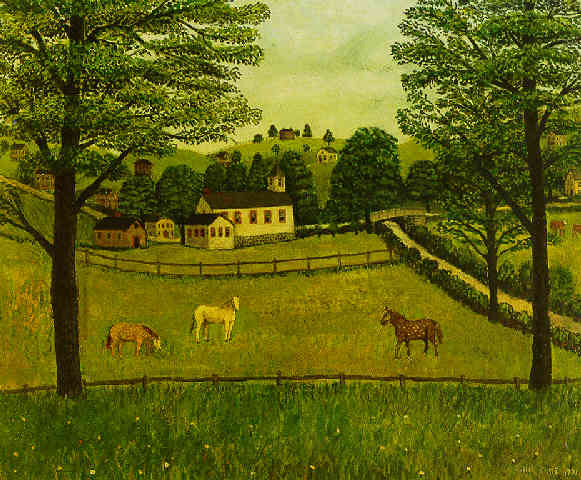 He left his wife and home after the death of an infant son in 1904 and began to paint on beaverboard landscapes of the Pennsylvania countryside and cityscapes of Pittsburgh. He lived apart from his wife for the next 23 years. 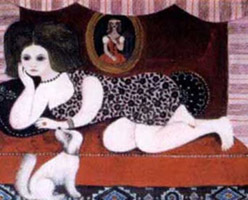 artist whose real name was Marie Smirsky. 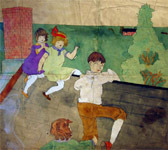 born September 7, 1860, Greenwich, New York, U.S.
byname of Anna Mary Robertson Moses , original name Anna Mary Robertson American folk painter who was internationally popular for her naive documentation of rural life in the United States in the late 19th and early 20th centuries. 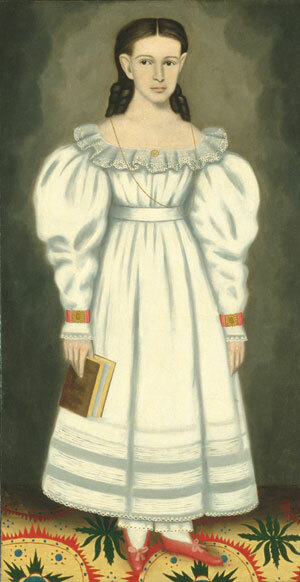 Anna Robertson had only sporadic periods of schooling during her childhood. At age 12 she left her parents' farm and worked as a hired girl until she married Thomas Moses in 1887. They first farmed in the Shenandoah Valley near Staunton, Virginia, and in 1905 moved to a farm at Eagle Bridge, New York, near her birthplace. Thomas died in 1927, and Anna continued to farm with the help of her youngest son until advancing age forced her to retire to a daughter's home in 1936. 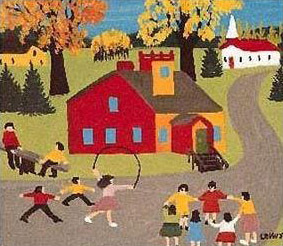 From the beginning Grandma Moses's work received favourable criticism. 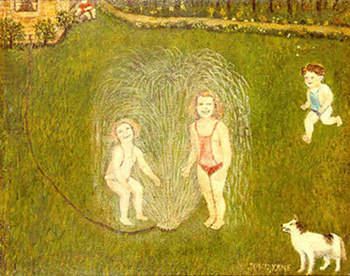 In October 1940 a one-woman show of 35 paintings was held at Galerie St. Etienne in New York. 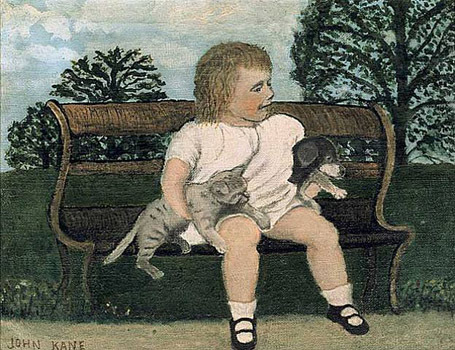 Thereafter her paintings were shown throughout the United States and Europe in some 150 solo shows and 100 group exhibits. 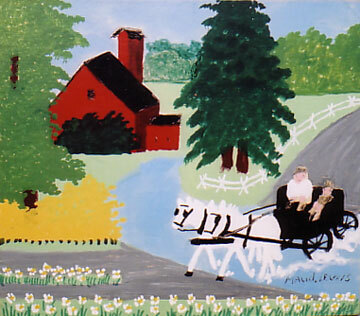 Throughout her lifetime Grandma Moses produced about 2,000 paintings, most of them on masonite board. 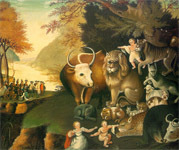 Her naive style (labeled “American Primitive” by art historians) was acclaimed for its purity of colour, its attention to detail, and its vigour. 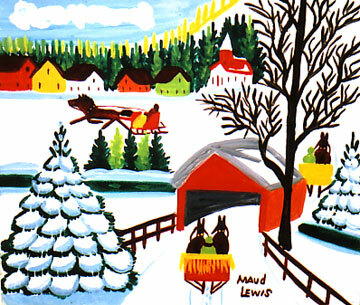 Her other notable paintings include Black Horses (1942), Out for the Christmas Trees (1946), The Old Oaken Bucket (1946), From My Window (1949), and Making Apple Butter (1958). 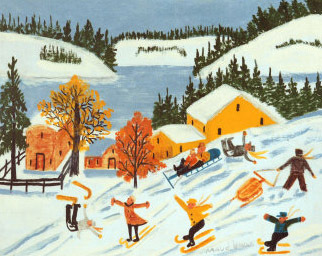 From 1946 her paintings were often reproduced in prints and on Christmas cards. Her autobiography, My Life's History, was published in 1952.